This was our first publicity, times have changed! Formed in 1997 Clatteratti have played for hundreds of clients in a huge variety of venues all over the world, from the middle of a race track in Istanbul, to a pool side in Tenerife, from the dusty streets of Dubai to a music stage in Holland, from Jordan to Sardinia, and from Brighton to London via Cardiff, Leeds and Manchester, We’ve played the Royal Albert Hall with Disney and we’ve played outside a local Spar in Watford, no gig is too big or too small, this year we played to 5,000 walkers at the Moonwalk Charity walk London and 3,000 at the SkyShow. We’ve played at gala dinners, award ceremonies, in Harrods, Sothebys, the Science Museum and the streets of Brighton, from BBC Live Leeds to BT Sport and from Manchesters’ Skyride to the Olympic Park. We welcome performers from all disciplines, some of our drummers have worked with Stomp, Ra Ra Zoo, Soul 2 Soul, Roachford, Maracatu, Barulho, to name but a few. 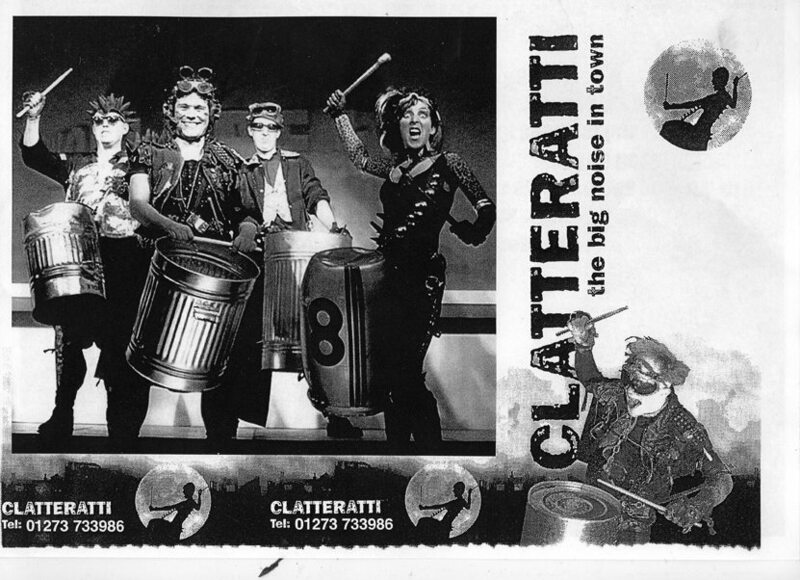 Founded in London in 1997 by artistic director Chris Cresswell, with Sarah Lovett, Adrian Barker and Mark Fury, the Clatteratti has gone from strength to strength and welcomed all kinds of artists into the fold. Currently Maestre Paul Dodd (Maracatu), Nick Pitcher (Spitfire) Joe Pryor (Raineater) Chris Taylor (Soul2Soul), Rob Arcari, Jen Clarke (Jentheroo) Carola del Mese (CandyQueens) we also recently welcomed angle grinders Kelly Sabrina and Kate Lomax, over the years other contributors have included Matt Cooke (Barulho) Carl Smith (Stomp) Becki Hodgson (Carnival Collective) Aideen Gallagher (Stomp) Oli Tumner (Stomp) Brian Cooper, Manu Fruteau, Siobhan Potter, Bob Percy, Carli Jefferson, Max Machin, Rafael Casarini, Will Roper, Janine Fletcher, Suz Hawkins, Kt Simpson (CopperDollar) Suzanne Mehdi, Lucia Cordani and others too numerous to mention, oh and Toby Park (Spymonkey) once joined us for a gig in Tenerife! Royal Kingdom of Jordan, Royal Albert Hall, Olympic Park, Cardiff Arena, Tenerife, Dubai, Sardinia, Porto Marino Egypt, Istanbul, Holland, Royal Chelsea Flower Show, London, Winchester Hat Fair, Leeds Festival, Manchester Festival, O2, Brighton Dome, and many other places in the UK.